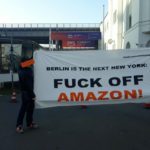 Call-out - Make Amazon Pay! For almost four years, Amazon employees have been fighting for the recognition of their demands against the company’s management. It is no longer just a matter of a few more euros of wages which would secure a collective agreement; here we have an ill-working environment, and humiliating control and the disrespect of the employees by the management. With an action week around the Black Friday of 24.11.17 (Amazon‚s international bargain day) we want to support the struggling workforce. On Black Friday, we want to strengthen the impact of pre-Christmas strikes by blocking an Amazon site. The inner-city distribution center in the Kudamm-Karree in Berlin guarantees delivery of the products stored there within two hours (for prime customers even within an hour). Because of the narrow side streets, this is a quite vulnerable guarantee! 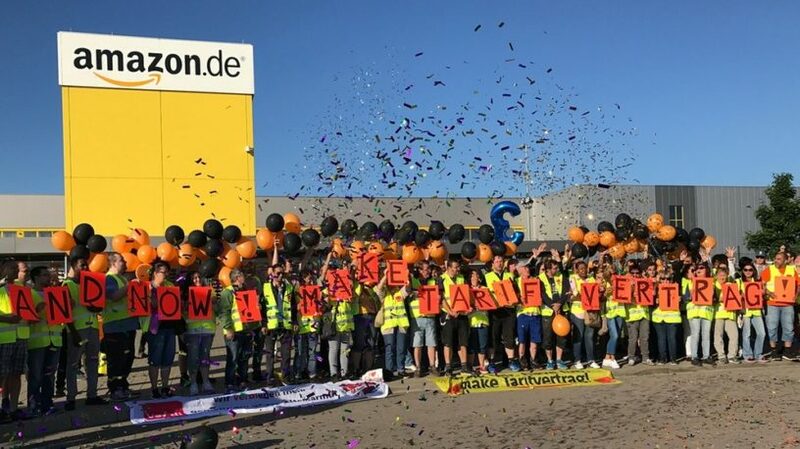 Amazon customers who are in solidarity with the workers will be sending out an increasing numbers of orders (free of shipping costs) during that week and then returning them back, including solidarity messages to the workers. We do not know, whether this action day could also result to the blockade of the Amazons website. However, further interferences of this kind in solidarity to the workers are to be expected. Performance compaction and physical long-term damage characterize the work situation in the plants known as Fulfilment Centers (FC). Amazon’s learning storage software provides the speed and flow of all work steps and thus takes over the „control“ of the employees, who are reduced to sensory-motor tools: they detect signals, scan goods, grab, lift, push, run – 20 km per day, 200 packets every hour. At the same time, algorithms capture all movement profiles and completed work steps, create individual performance profiles and collective average productivity, which are presented to the the workers as supposedly objective requirements – a panoptic factory in which the complete recording of work and its evaluation lead to psychological pressure and stress. The performance pressure is increased by the strategic use of temporary employees in structurally weak regions, which have to exceed the performance requirements in view of a fixed employment. With this willing reserve army, a disciplinary regime is being set up, which links fear of social decline with internal competition. In order to combat the above-average incidence of illness of up to 20%, Amazon introduced an „attendance bonus“ at some locations – not for each individual employee but in overall team assessment. Departments that have fewer sick days on the negative account receive a bonus of 70-150 euros per employee per month. This is not just poison for the working environment. It also negates illness as a normal component of (working) life, particularly as a result of a monotonous and unilateral workload. Amazon is a style icon of the strength of a new production model that uses intelligent information technology to more effectively subordinate human labor so as to tap new growth potentials. We are witnessing here how the Fourth Industrial Revolution and the Internet of Things will fundamentally change the way we work and live, be it in the digital update of industrial lean-production, the standardized calculation of medical treatment routines or in the organization of precarious working conditions on crowdworking platforms. However, in the narratives of some keyword suppliers for the historical project of a knowledge-based and creative working world, there is a further expropriation of the productive knowledge of those who are controlled in the machine room of smart capitalism by an algorithmic nervous system for the exercise of de-qualified and socially unsecured activities, or who as unemployed have long been superfluous for the interests of the capital. The algorithmic external determination does not stop at the „plant gates“ at Amazon. Everyone is integrated as simple user into the process of permanent assessment and self-learning evaluation – not just for online shopping. In particular Amazon’s use in many services of active artificial intelligence for speech recognition is designed on the evaluation of all life movement. With scoring approaches and methods of the behavioral economy, Amazon takes control in our information gathering, and our thinking. If we do not want to abandon our counter-design of a social participation in a far-reaching self-determination, we must attack the participatory adaptation of our self by permanent (self-) assessment as the basis for (external) control. What is expressed in the struggles of the pickers and packers, the employees in the receiving, the stowing and the shipping is the claim to see the production space as a political field again. Against the arbitrary application of their own as capital-compliant-controlled apparatuses they place the demand to participate in, the application of digital technology and its effects on the work. This is not only about the affable concessions of the management, but about the principle of the direct recognition of the direct producers as actors with democratic interests and rights in the production area. Because Amazon can be regarded as an avant-garde of a society as a whole, it is necessary to support the struggles of the workers. The success of the colleagues at Amazon will also be our success! For this reason, we propose to the radical left, with the workers at Amazon, to attack the violence of the production process, to support the strikes at Amazon effectively and thus help out a bit by nudging the negotiating will of the management of the company.